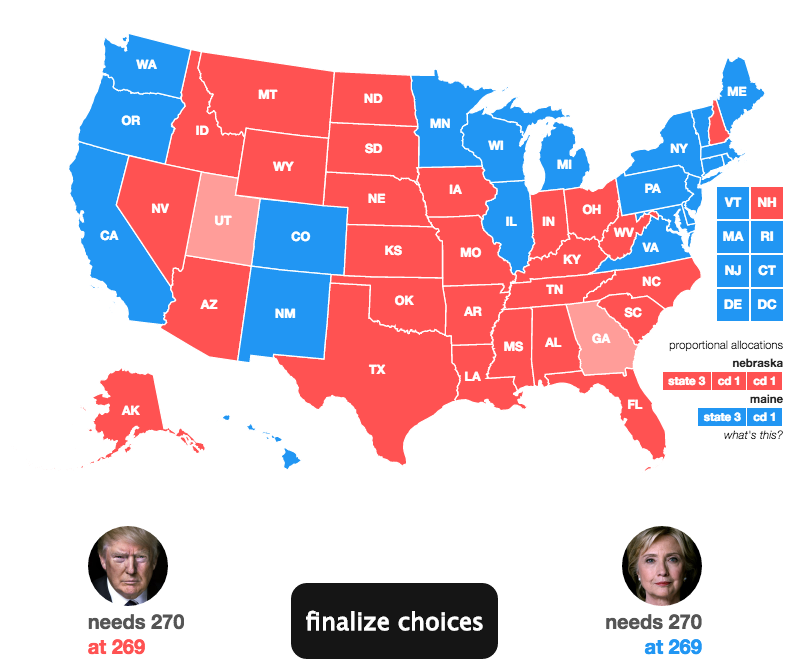 Of the many comforts Democrats offer themselves as bad news pours in regarding the viability of Trump’s candidacy, the latest and greatest is the electoral map myth—the idea that even if Trump manages to stay close to Clinton on a national level, he can’t summon the necessary electoral votes to reach 270 and actually win. And like the rest of the comforts, this one has lately proved to stand on a faulty foundation. A series of Quinnipiac polls released on Thursday shows Trump leading Clinton in Ohio by four points, and tied in Florida at 43 percent each. Meanwhile, Clinton actually leads in North Carolina and has a slim edge in Pennsylvania, while another poll shows that Trump is within five points in Colorado. There are two conclusions to draw here. The first is that we could be in for the strangest electoral map in recent history, with traditionally blue states veering red, especially in the rust belt, and reliably red states like Texas and North Carolina (which, to be fair, went to Obama in 2008) shifting in the opposite direction. Clinton still holds the advantage, and would need to win only one of the toss-up races like Florida, Ohio, North Carolina, or New Hampshire to secure a victory, but if you project Trump’s resurgence outward to November, who’s to say he won’t actually improve his numbers in swing states? The point is, as much as it may hurt to consider the possibility of a Trump presidency, that’s exactly what the electorate needs to do, and fast. Complacency—including media complacency—has bestowed legitimacy on a man who keeps slouching closer and closer to our nation’s highest office.